After every Adhyaya of Bhagawad Geeta we recite: “iti Bhagawada Geetashu Upanishadtshu Brahma Vidyaayaam Yogashastre, Shri Krishnaarjuna samvaade (for example) Bhakti yoga Naam Dwadashodhyayaha” here the important reference to ‘Brahma Vidya’ means the Knowledge of ‘Brahma’ as it is in the Bharatiya philosophical tradition. It consists of seven streams. And ‘Yogashastra’ means science of yoga, Karma Yoga or Samatva Yoga; specifically Pra-Yoga shastra – is the intended meaning here. Yoga shastra here, in the Bhagawad Geeta is science based on the seven streams, which is practically useful in one’s life, ‘Jeevan Shastra’. This Shastra referred here is called ‘Upayojit Brahma Vidya’, which means ‘Vyahaaric’ – useful in practical life. In reference to this aspect, Acharya Vinoba Bhave, in his book ‘Vellore Pravachane’ has given proper, to the point explanation. His book ‘Geeta Pravachane’ was written while he was interned in the jail in 1932 at Dhule, in Maharashtra. While the other, ‘Vellore Pravachane’ is the gist of another set of speeches given in 1944, when he was imprisoned at Vellore (Tamil nadu). In this book,(Pgs.5 -1 3) Vinobaji has given highly important original information, of the oldest philosophy prevalent in the time much earlier than the Bhagawad Geeta. It is very important for us to take note of this. Custom of Upasanaa, given in the Vedic literature. Karma Mimansaa – explanation of karma. The ‘Aatma Gnyaan’ described in the Upanishads. Practical ‘Sankhya’ philosophy of Kapil Muni. Dhynaana Yoga, involving control of one’s own Mind. Pramana – Mimansaa: discussing proof, arguments, and justice. These were the seven streams of ‘Brahma Vidya’ in the times prior to Mahabharata, and Bhagawad Geeta. 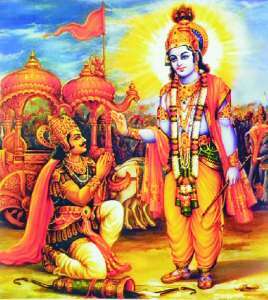 Now in the light of this previous knowledge, what was the position in the Bhagawad Geeta? What did Geeta teach? Actually there were shastras, rules, philosophy, knowledge etc. in ample measure, but there was no proper coordinated logical discussion for coming to an agreed conclusion, to find and apply remedial measures for the faults arising from time to time. Geeta filled this gap. It is essential that the important basic principles need to be implemented in the practical life and thereby serve the humanity. Also the faults arising in the individual and social life have to be remedied in good time. Geeta played the important role to coordinate and bring cohesion in the prevailing thinking and coordination among the prevailing strands of social and spiritual life of the people. It placed the ideal of active and benevolent life before the people, like adding sugar to the milk. The result was that the coordination between the worldly and spiritual requirements of the individual and social life was achieved. The principles of social behavior in this world and the spiritual side were made cohesive. The very best philosophy of Brahma Vidya was brought to bear on the traditional customs in the normal life of society. The True principles were brought in the everyday life of the people, thus clearing the way to spiritual progress. Thus it is clear that Bhagawad Geeta has conferred plenty of blessings on the people of Bhaarat. It should be noted that Bhagawad Geeta does not condemn any new thought or principle. It makes an effort to understand and interpret the same for any truth in it, and thus enriches its teaching; only with one proviso that it does not dilute the essential principles of spiritual life, but bring out the best as the result of this process. With great skill it integrates the new with the extent to the overall benefit of the society and mankind by the resultant code of individual and social conduct – ‘Manav dharma”! Therefore those who have studied Geeta say that Bhagawad Geeta have picked up ‘Atma Gnyan’ – knowledge of the ‘SELF’ from the Upanishad and the concept of Kartavya – Duty from the ‘Samaj Dharma Shastra’, and by blending the two established ‘The Yoga of Social Duty, ‘Swadharmanishtha Jeevan Yoga’. Thereby Yogashastra of Brahma Vidya was transformed into a highly useful ‘Pra-Yoga Shastra’. Thus a strong foundation for ‘Jeevan Yoga’ was established! 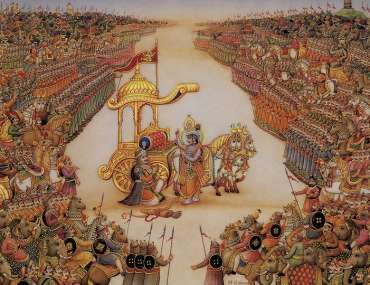 What was the specific intention of the Geeta? 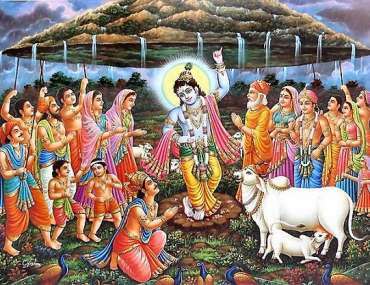 The answer is to remove the ‘Moha’ – confusion in the society, Manav Jati, practical social life through the example of Arjuna! This is the intention of Bhagawad Geeta. Then what happened? Seeing before him, revered elders like Bhishma, Dronacharya and others, Arjuna, already soft natured, lost nerve. Victim of momentary soft heartedness, he felt downcast. A storm of feelings arose in his heart. Thus affected, he began supporting his weakness for moment by arguments. His was neither Nivrutti-vad, desire to leave the world; nor was it disinterestedness. In fact so far he had fought many battles, vanquishing countless brave opponents. He had punished the wicked. He had faced Lord Shiva Shankara Himself. But never had he felt like this. Now at this time, seeing Grandfather Bhishma, guru Dronacharya, and other relatives before him Arjun was facing a dilemma. To be continued, in Part 2 of same chapter. Copyright © 2018 by Geeta Dharma Mandal Pune. All rights reserved.